Jewish Home Cooking by Arthur Schwartz. 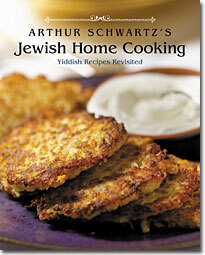 If you love to cook --- or just to eat --- then get to know Arthur Schwartz. The New York Times Magazine called him "a walking Google of food and restaurant knowledge." For 18 years he was restaurant critic and senior food editor for the New York Daily News, and for 13 years was the host of his own radio program, "Food Talk with Arthur Schwartz" on WOR talk radio. This "food maven," as he is known to his readers, listeners, and fans (and is the name of his popular website) is also an expert on the immigrant culinary experience of New York's Lower East Side. Insiders will thrill to see so many of the old time establishments in these pages, such as Yonah Shimmel Knish Bakery, Ratner's, Russ & Daughters Appetizing, Sammy's Roumanian Steak House, the Parkway East, and the fancy-schmancy Moskowitz and Lupowitz. As the saying goes, "You can take the girl out of New York, but you can't take New York out of the girl!" Every few years, usually before Rosh Hashannah, I recall family forays from Long Island to the shops between Delancey and Houston Streets for pickles, smoked fish, dried fruits, nuts, and candy, culminating with a special lunch at Ratner's. So the day Arthur Schwartz's Jewish Home Cooking arrived on my door step, I headed for the coziest chair in the house with a cup of tea and settled in for a virtual stroll down memory lane. Recipe after recipe brought a delightful wave of nostalgia . . . I could almost smell the fantastic aroma of the Garlic and Paprika Rubbed Roast Chicken sizzling away in my mother's kitchen, and taste the Chocolate Babka — its rich, sweet dough layered with chocolate, redolent of cinnamon, Kasha varnishkes (the perfect accompaniment to roast chicken), matzo meal latkes, salami and eggs. These were recipes that were seldom written down: rather they were known by heart and passed along by so many Eastern European immigrant families. Jewish Home Cooking is Schwartz's seventh cookbook and perhaps his most personal. A good many of the recipes are those his mother made in her own kitchen every day, and which Schwartz still cooks at home in Brooklyn. His mom's Passover apple cake, noodle kugel, and pot-roasted brisket are just a few of the classics you'll find in the book, along with recipes for chopped liver, kreplach, health salad, karnatzlach (little Roumanian garlic sausages), potatonik (potato bread), shlishkas (Hungarian potato dumplings), fresh schav and several kinds of borscht . . . to name just a few. There's also a great selection of traditional and new Passover offerings here. Schwartz's philosophy in Jewish Home Cooking, even with the periodic, usually verboten additions of schmaltz (chicken fat) and gribbenes (the delicious, crispy byproduct of the rendered fat), is that these foods can be updated to be both healthy and as satisfying as their original recipes. Schwartz relates: "One problem with old-time Eastern European Jewish foods, Ashkenazic food — let's call it Yiddish cooking, as it is the food of the people who spoke and speak Yiddish — is that the recipes are dated. They come from a time when few people related what they ate to their health and well-being. They come from a time before elliptical machines and treadmills. However, Yiddish cooking can be prepared in a more healthful manner, and more to toady's tastes. . . . This book tells you how." The first and final foods pictured in the book might just sum up the world of Yiddish food. First, a big serving of chopped liver, described here as "a treat, a godsend, a delicacy, an emblem of the Eastern European Jewish heritage." And last, that iconic tonic, the egg cream: no egg, no cream — basically a fizzy chocolate milk — but what could be better? Following all these great Yiddish recipes is a great glossary of Yiddish food terms, from Arbes (seasoned chickpeas) to Zemmel (flat onion rolls). Es gezunterheyt (eat in good health)! "Long before contemporary chefs used rubs to season food, Jewish mothers were massaging chickens with garlic, paprika, salt and pepper," Schwartz writes. For some reason I've never thought of chicken cooked this way as being a particularly Jewish dish — it was simply the way my mother and grandmothers most often cooked chicken, and the first chicken recipe I ever learned to make. In a small bowl, blend together the garlic, paprika, salt, pepper, and oil. On a cutting board, cut the chicken in half alongside the backbone. Cut out the backbone. (Arthur Schwartz likes to roast the backbone alongside the chicken, allowing himself the pleasure of eating it — the cook's share.) Place the chicken, skin-side up, and press the butterflied chicken down to flatten it. 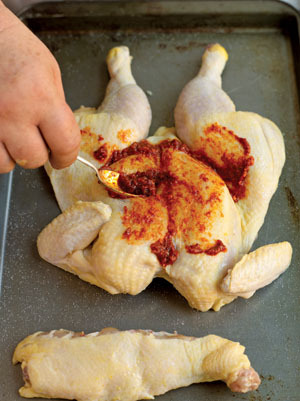 Massage the chicken on both sides with the garlic-paprika paste, pushing some of it under the skin. Place the chicken, skin-side up, on a jellyroll-type baking sheet. Roast for 45 minutes. Remove from the oven and let rest for 45 minutes before cutting into serving pieces. The word varnishkes is connected to the word vareniki, which today is the Ukrainian word for a filled dumpling and originally meant a rectangular noodle. 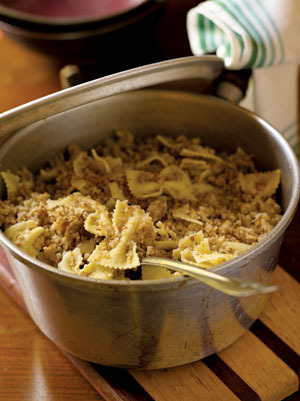 Today, and for as long as anyone alive can remember, kasha varnishkes is kasha tossed with bow-tie egg noodles, and fried onions. For authentic flavor, use chicken fat if you can, or part chicken fat and part vegetable oil, though canola, peanut or corn oil (the oils most recommended in the book) will certainly do. To prepare the kasha, if possible, deglaze the pan from frying the onions with 2 cups of water. Pour the deglazing water into a 1-quart measuring cup. Add 1/2 teaspoon salt and 1/4 teaspoon pepper, then add the 2 cups of broth (to make a full quart of liquid) and set aside. If the onions have been fried ahead of time and there is no pan to deglaze, use 4 cups of broth or all water. If using water, not broth, add an additional 1/2 teaspoon salt and 1/4 teaspoon pepper — that is, double the salt and pepper. In a small bowl, mix the kasha and beaten egg together well. Put the egg-coated kasha in a dry, 10-inch skillet or medium saucepan that has a cover. Place the pan over medium-high heat and stir constantly until the kasha separates into individual grains again, 2 to 3 minutes. The grain's earthy aroma will come up from the pan. Immediately add the reserved liquid. As soon as the mixture begins to simmer, cover the pan, and decrease the heat to medium-low. Cook for 7 to 9 minutes, until the kasha is tender. Fluff the kasha with a fork and set aside, partly covered to let the steam escape. In a large pot, bring about 3 quarts of well-salted water to a rolling boil over medium-high heat. Add the bow ties and cook until tender. Drain well. Add the fried onions and boiled bow ties to the kasha and toss together until well mixed. Serve hot. The dish can be made ahead and reheated, covered with a lid or foil, in a 300 ° to 350 ° oven. Anyone who's been to a real Jewish deli has experienced this colorful, sweet-and-sour vegetable salad. Arthur Schwartz surmises that it's called "health salad" because, like most other coleslaws, it isn't made with mayonnaise, and is "a veritable tonic compared to the other salty, fatty foods that are the hallmarks of a Jewish delicatessen." If you love this salad, as I do, and wished you knew how to make the real McCoy, be happy because now you will! To prepare the salad, halve the cabbage, cut into quarters, and remove the core in each section. With a large, sharp knife, shred the cabbage as finely as possible and transfer to a large bowl. Using the coarsest side of a box grater, shred the carrots into the shredded cabbage. Halve the green pepper and remove the seeds, ribs, and stem. Wash and dry the pepper halves, then cut them into extremely fine strands; add them to the slaw along with the celery. To make the dressing, whisk together the vinegar, oil, sugar, salt, and pepper in a small bowl. Pour the dressing over the slaw. Toss well. Refrigerate the slaw, tightly covered, for at least 8 hours before serving. As the slaw will not wilt much, it should remain crisp and fresh tasting for 2 to 3 weeks. The word Babka comes from the word meaning old lady or "grandma" in Polish — baba, explains Schwartz, and the cake was often baked stout and round. 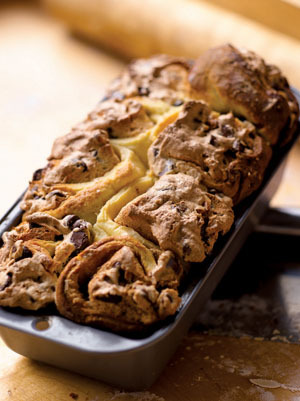 In this interesting version, the dough is rolled out like a jelly roll, filled and sliced into equal-size portions that are baked on their sides in loaf pans. The recipe here calls for semisweet chocolate chips, however an equal portion of shaved or chopped bittersweet chocolate renders a great result as well. The recipe is on the long side but well worth the effort. To make the dough, in the bowl of food processor fitted with the metal blade, combine the flour, salt, and 3 heaping tablespoons of the sugar. Pulse to blend. Add the pieces of butter to the flour mixture and pulse until crumbly. In a small saucepan, heat the milk over low heat until warm, not hot, to the touch (no more than 110° F). Stir in 1 level tablespoon of the sugar and the yeast. Allow to stand for 7 minutes, until bubbly and risen. Add the egg yolks and yeast mixture to the flour mixture. Pulse several times, scraping down the bowl once or twice, until a ball is formed. Remove the dough and place it in a large bowl. Cover with a clean towel and refrigerate overnight. Grease two 8 1/2- by 4 1/2-inch loaf pans. To assemble the babkas, in a stand mixer fitted with the whisk, beat the egg whites until soft peaks form. One tablespoon at a time, add the remaining 1/2 sugar, then the 1 teaspoon cinnamon. Beat until the whites form firm peaks. Divide the dough in half. Keep one half refrigerated while working with the other. For each half, knead the dough a few times. Roll out on a floured surface to an approximately 22- by 18-inch rectangle. It will be thin. Spread the rectangle of dough with half the beaten egg whites to within 1 inch of the edges. Sprinkle evenly with half the chocolate, half the walnuts, and lightly with more cinnamon. Turn in about 1 inch of the short edges of the dough rectangle, then carefully roll up jelly roll-style. If the dough is sticking slightly, use a bench scraper (pastry scraper) to ease it off the work surface. Cut each roll into 8 sections. For each babka, place 8 sections in 1 loaf pan, cut sides up and down, packing them so the uncut sides touch. Cover each with a clean towel and let rise at room temperature for about 2 hours. The dough should come up higher than the sides of the pans. Position an oven rack in the center of the oven. Preheat the oven to 350° F.
Bake the loaves for 35 to 40 minutes, until light brown. Cool the babkas in pans for about 5 minutes, then invert them onto serving plates. Serve top side up or bottom side up, whichever looks better to you. Slice with a serrated blade or break apart into natural segments. Reprinted with permission from Arthur Schwartz's Jewish Home Cooking: Yiddish Recipes Revisited.